The Quickfinder Tax Tips Newsletter is a monthly newsletter from the trusted source you rely on for fast, accurate, tax and financial planning information. Each month, the Newsletter brings you concise, easy-to-understand coverage of the latest essential tax developments including tax law changes, IRS releases, and court decisions, plus timely tax planning strategies that you can use to guide your clients. The Newsletter also includes a monthly calendar of important tax due dates. 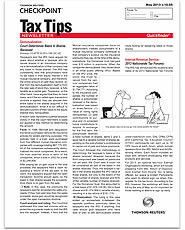 The Quickfinder Tax Tips Newsletter keeps tax planning answers at your fingertips and keeps you up to date throughout the year. The Newsletter will complement your library of Quickfinder Handbooks.